Some pictures I have snapped with my cell phone over the past years. Even though the quality is horrible, I find it much easier to snap opportunistic pictures with a cell phone rather than with an actual camera. Someday I'll have to get a phone that has a decent camera attached to it... I feel that random moments are best documented in this way, without something as definite and bulky as a camera viewfinder between the subject and myself. In other words I often hesitate to bring my camera everywhere with me because a: I feel that the act of taking a picture interferes with the experience of the moment and with memory, and b: pictures often lack the quality of the moment, and at best are tokens for the memory. 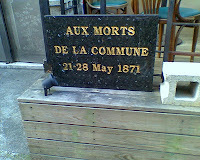 "Aux Morts de la Commune" a marble slab outside a bar in Taipei commemorates the Paris Commune of 1871. 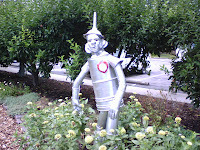 The Tin Man, encountered at Crosby Gardens in Toledo. 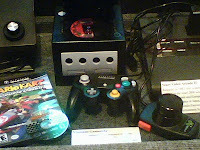 The Nintendo Gamecube as a museum piece, local history museum near Clearwater, Florida. Parts of a roller coaster traveling north on I-75 near Bowling Green, Ohio. 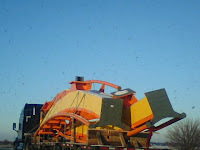 I think this was heading to Cedar Point, since it was the winter before they built the Maverick. 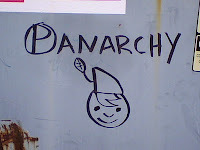 "Panarchy", puckish dumpster graffiti in the alleys of Columbus. 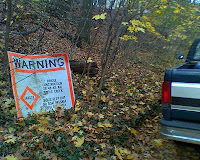 Maritime caution sign such as usually found on the sides of a river channel, spotted alongside the roadway at the bottom of Iuka Ravine, Columbus. 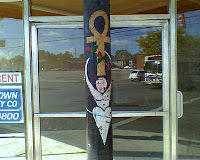 Goddess and Ankh artwork on pillar in front of a former occult bookstore in the Short North, Columbus. 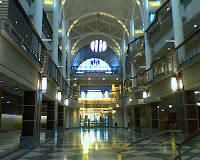 Atrium of the newly built OSU Student Union. 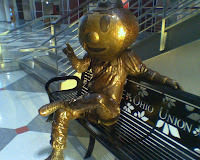 Brutus the Buckeye, cast life-size in bronze. 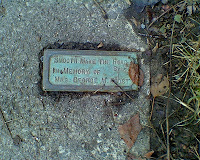 Memorial plaque made of bronze embedded in the sidewalk on 4th street. 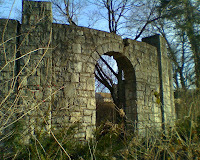 Ruins in Riverside Park by the Griggs Reservoir. They reminded me of illustrations of Tolkien's Middle Earth. 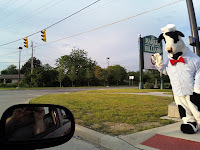 Cow mascot seen in Hilliard. 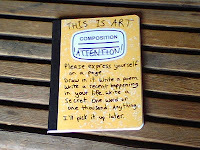 Notebook found on bench at Woodruff Ave bus stop on the OSU campus. I couldn't think of anything clever to write.